It is that time of year again when hunting and outdoorsmen start outfitting for the season. What better way to boost your chances of a successful hunt than with a range finder. 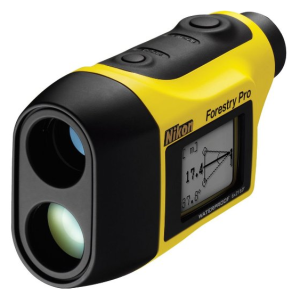 I have used a variety of rangefinders in my day and the Nikon Forestry Pro Rangefinder is one of the best I have seen. I say this for many reasons which will be outlined in this review. Has a measurement range of 999 feet. Is accurate to within a few inches at the maximum range (999 Ft). In addition, the Forestry Pro has these features. Measures not only actual distance but also horizontal distance, height difference between two objects. Three-point measurement is also available. Has internal and external LCD displays. All information is shown at the same time on both displays. Target Priority Switch System differentiates distance between two objects. These are labeled First target priority and distant target priority. Very useful in heavily wooded areas. Multilayer coating on lenses provides bright, clear images up to the maximum magnification (6X). Large eye relief design lets those who wear glasses easily use the rangefinder. Takes a continual measurement up to a full 20 seconds. Unit is waterproof up to 3 feet for 10 minutes. Unit is not made for underwater use. Water resistant battery chamber. Works uniformly between -10 degrees Celsius to 50 degrees Celsius. So how easy is this rangefinder to use? This is the real genius of the Forestry Pro model. It is simple to use and read. You will not need to pull out the manual every time you put this unit to use. Just turn it on, point it at your target and see how far it is. Now you can adjust your scope or sights for the shot. Also due to the small overall size of the Nikon Forestry Pro rangefinder, it can be taken anywhere and not be cumbersome. Put it in a vest pocket or a backpack and you’re off. It even comes with a convenient carrying case. On that note, some folks have used this in rock climbing applications to gauge distances, angles and trajectories. Others while cruising timber in logging areas. This rangefinder is truly a multiple use item. I am personally very happy with this product’s performance. The distances are extremely accurate and the angles and height calculations are dead on. You will like the monocular eyepiece too. It is comfortable and should you need to, it allows you to momentarily look away with your other eye. It has a massive amount of eye relief as well. I use rangefinders to adjust my scope’s windage ad elevation for a shot. The distance to the target is tantamount to that adjustment. I have been right on target 9 out of 10 times while using the Nikon Forestry Pro rangefinder. Others have stated that they have used more expensive units with fewer features. The Forestry Pro has all the features you will ever need at an average price of about $375, so this doesn’t break the bank either. With the first animal taken on a hunt, you will have more than paid for the Nikon Forestry Pro.